Chapin Cutler displayed a roll of 70mm movie film. “We would like to feel that we’re opening a door to a trend,” he said about using the format. 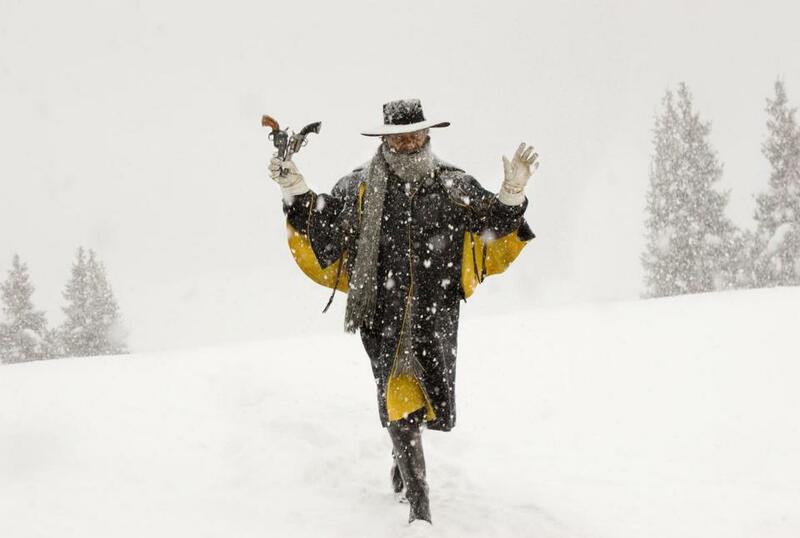 The Hateful Eight,” the new movie from renowned director Quentin Tarantino, was shot the old-fashioned way. Forget about digital cameras — Tarantino used the same kind of giant-sized 70mm movie film once reserved for 1950s biblical epics. 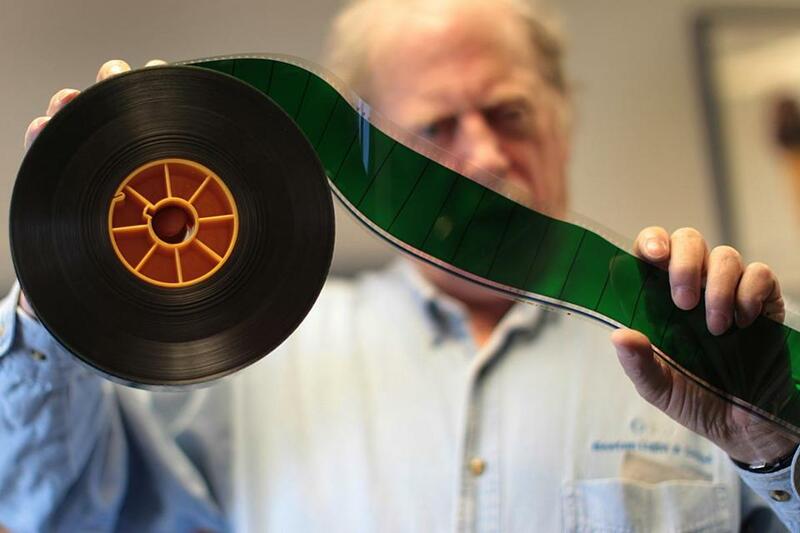 And when the movie debuts on Christmas Day, 100 US theaters will screen the movie using old-school large-format film projectors instead of digital, thanks to a Brighton company that tracked down and restored dozens of obsolete movie projectors. “We would like to feel that we’re opening the door to a trend — a trend that revitalizes the movie-going experience,” said Chapin Cutler, cofounder of Boston Light & Sound, a multimedia consulting firm that has designed audio and video systems for venues ranging from the Roman Coliseum to Fenway Park. Cutler and his partner Larry Shaw founded the company in 1977, mostly to provide equipment for so-called dailies, the scenes shot each day on location. These pieces of film are shipped to a lab for processing, then returned to the shooting location, where the crew can view them to make sure everything looks right, and reshoot scenes that don’t measure up. But when the Weinstein Co., producer of “The Hateful Eight,” asked Cutler to provide equipment for screening Tarantino’s dailies, there was a catch. These days, most movies are shot and projected digitally, making it easier to view dailies. But Tarantino was shooting his new movie the old-fashioned way — on film. And in particular the big, fat 70mm format used by the grandest of old Hollywood films. Movies shot on 70mm can seem bigger and, at the same time, more intimate. The huge screen images seem to draw the viewer into the scene, while the picture is so sharp the eye can pick out every detail of the sets and costumes. Combined with early stereo surround-sound, a 70mm movie could be a deeply immersive experience. “Seventy mil was introduced in the 1950s as a way to lure audiences back to the movie theaters in the aftermath of the advance of TV,” said Peter Flynn, a senior scholar-in-residence at Emerson College and director of “The Dying of the Light,” a documentary about movie projection technology. “It was the IMAX of the day,” Flynn said. Tarantino’s movie, about a band of strangers in an isolated mountain cabin, won’t feature many of the vast landscapes seen in classic 70mm movies. But the director told the Web publication The Verge that the wide 70mm screen is a superior format for serious storytelling. Finding projectors for theaters to show the movie in 70mm was even tougher. Nearly all had been mothballed or scrapped. Erik Lomis, Weinstein Co. president of distribution, wanted Boston Light & Sound to find and refurbish at least 100 projectors for theaters around the United States. 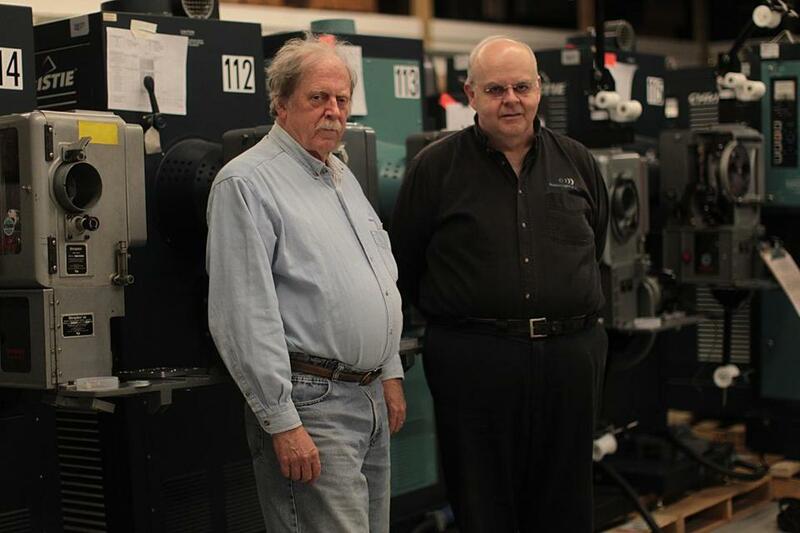 So Cutler went on a nationwide quest for the surviving projectors, collecting 120. Some he found at small, independent movie houses that had held onto them; others were in the hands of movie memorabilia collectors. “Some of the equipment had been run to death because the exhibitors knew they were going to get rid of it,” Cutler said. That meant months of refurbishing and repairs. “We had to replicate parts that are no longer in manufacture,” he said. They found old blueprints of the projectors, and had parts custom-made by machine shops. The biggest need was for the rollers that guide the film through the projectors. Each machine used dozens of them; Cutler ordered 5,000. Cutler won’t reveal how much it all cost. “Let’s just say it is not an inexpensive undertaking,” he said. Next came an equally challenging task — finding projectionists capable of screening 70mm movies. Running a movie projector today involves little more than pushing a button. Screening real film requires real skill. Between them, Cutler and Weinstein Co. have trained or recruited about 200 projectionists, enough for two shifts per theater. Many are veterans coming out of retirement. Tarantino also had a standard digital version so “The Hateful Eight” can be shown in most US movie houses. Once the movie run is over, Cutler said, the projectors will belong to the Weinstein Co., which will preserve them for their next 70mm movie. And will there be another? “ ‘The Hateful Eight’ is really going against all the trends in the industry right now,” Flynn said. He thinks it’s an open question whether the movie will be a one-off experiment, or lead a trend toward old-fashioned film-based blockbusters.